At the breakneck speed that music technology seems to develop and enter the market, interfaces seem to get left behind fast. But IK Multimedia seems to do a great job at solving these problems by putting out incredibly versatile, powerful and small interfaces and more that work seamlessly with the latest Apple and PC product. Their latest release is the iRig Pro I/O – the pocket-sized mobile audio/MIDI interface for iPhone®, iPad®, Mac®, PC and Android™ devices is now shipping worldwide. Featuring included software and apps that are unmatched in the category. 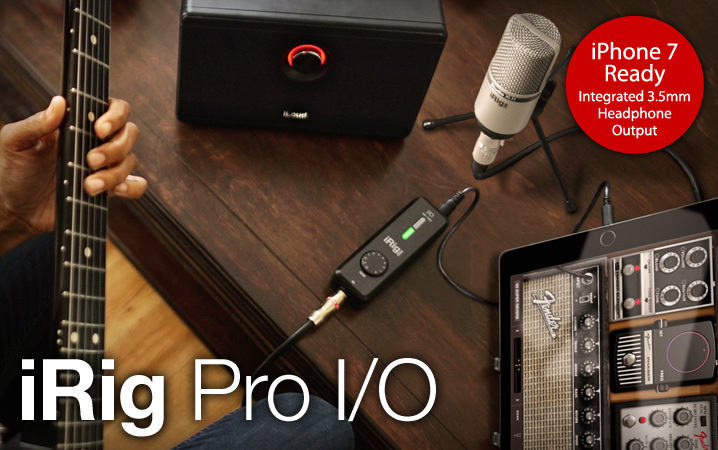 iRig Pro I/O is an ultra-compact, plug-and-play, truly portable interface that lets musicians hook up all their gear – guitars, basses, studio mics, vocal mics, keyboards and more – to their mobile devices or computers and record 24-bit/96kHz pro-quality audio and MIDI tracks anywhere. iRig Pro I/O features a high quality 1/8″ headphone/line out with level control for use with the latest Apple devices like the iPhone 7 to connect to headphones, mixers or powered monitor speakers in an ultra-compact enclosure that fits in a pocket and can be taken anywhere. Additionally, iRig Pro I/O is the first interface of its kind that includes built-in device charging for extended playing sessions, using an optional power supply.